Tree diseases are important components in healthy forest ecosystems but they can also have a detrimental impact on forest productivity and a devastating impact on urban tree populations. We continually are plagued with exotic pests that have been introduced into the United States, such as white pine blister rust and Dutch elm disease. We also have epidemics occurring from native diseases because of different environmental conditions, reduced levels of resistance in the host and disturbances in the forest from urban development and other activities that have changed the landscape. In forests, diseases are responsible for more than 65% of the wood volume lost each year and in urban areas diseases continue to be the major cause of tree decline and death. One of the reasons diseases cause such drastic losses is due to an incomplete understanding of basic biological and ecological processes that take place. We investigate how microbes, woody plants and the environment interact so a better understanding of these complex associations can be obtained and more appropriate, environmentally safe integrated control procedures developed. Wood decay fungi cause billions of dollars in losses each year by destroying wood in forest trees that could be used for timber, by attacking urban shade trees and by causing decay in buildings and other wood in service. Our research is providing new information on how these microbes function and finding better ways to control them. Although the negative impact of decay fungi can cause huge economic losses, new investigations on some forest microbes indicate that they can be used beneficially in a variety of new technologies. We have found that many microorganisms can be used for biotechnological processes in the wood products, pharmaceutical, and agricultural industries and we have selected and evaluated superior microbes for biological control, biopulping, biobleaching, depitching of wood chips before paper production, bioremediation of toxic substances, etc. These investigations will contribute significantly to more environmentally safe processes for industry, an improved way of life, and new economies from industries using these new biotechnological advances. 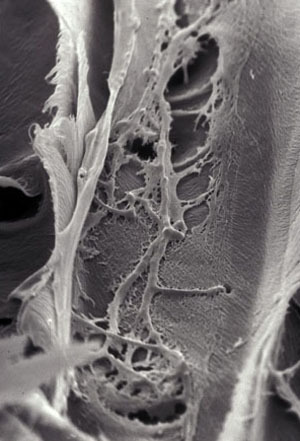 Microbes that degrade wood produce extracellular enzymes that break down the woody cell wall. Growth characteristics of the microorganism in wood and the type of degradative system produced results in different decay patterns being produced. Depending on the type of decay, different physical, chemical and morphological changes occur in wood. These decay processes have been well characterized and provide useful insights to elucidate deterioration in living trees and wood in service. 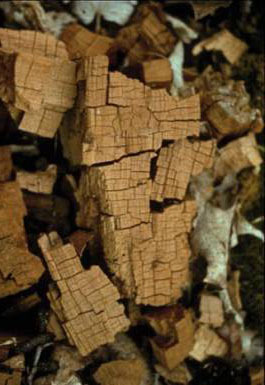 An examination of decay patterns produced by different fungi suggests that three categories can be used to separate the types of decay produced in wood. Names for these categories are based on visual characteristics of the advanced decay. Two major groups of decay produced by fungi taxonomically classified in the subdivision Basidiomycota, are white and brown rot fungi. 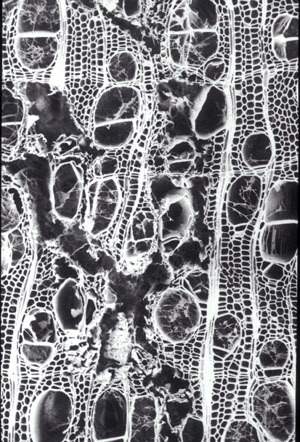 White rot fungi can degrade all cell wall components, including lignin. They often cause a bleaching of normal wood coloration. Their ability to metabolize large amounts of lignin in wood is unique among microorganisms. The thousands of species that cause white rots are a heterogeneous group that may degrade greater or lesser amounts of a specific cell wall component. Some species preferentially remove lignin from wood leaving pockets of white, degraded cells that consist entirely of cellulose, while others degrade lignin and cellulose simultaneously. Degradation is usually localized to cells colonized by fungal hyphae and substantial amounts of undecayed wood remains even after advanced decay has occurred. A progressive erosion of the cell wall occurs when components are degraded simultaneously or a diffuse attack of lignin may occur by species that preferentially remove lignin . Strength losses are not significant until late stages of decay. White-rot fungi are common parasites of heartwood in living trees and are aggressive decomposers of woody debris in forest ecosystems. Cross section of an oak tree with white rot. The fungus has decayed the sapwood and dark heartwood turning it white. This white rot fungus attacked all cell wall components. A cross section of wood with white rot showing the fungus has degraded some cells completely but not others. 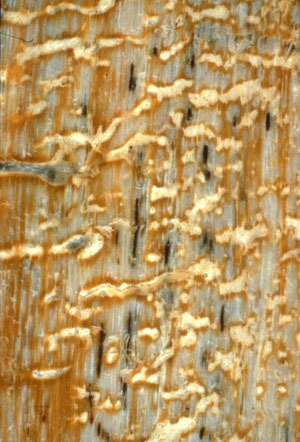 A split section of a pine tree with white-pocket rot caused by Phellinus pini. The white areas are delignified zones where the fungus has removed lignin but not the cellulose. 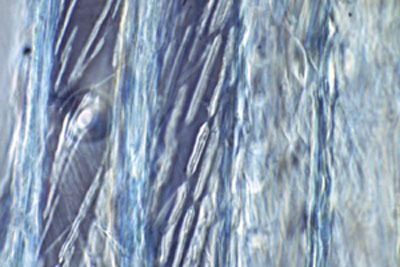 White-pocket rot fungi cause a selective attack on lignin and hemicellulose in wood. A mottled white rot in wood decayed by Ganoderma applanatum. This fungus causes a combination of delignification and a simultaneous white rot attack in the wood. White areas with black spots containing manganese (deposited by the fungus) are delignified while the tan areas have a simultaneous white rot. In the tan areas large degraded zones form and these holes fill with white mycelium of the fungus. 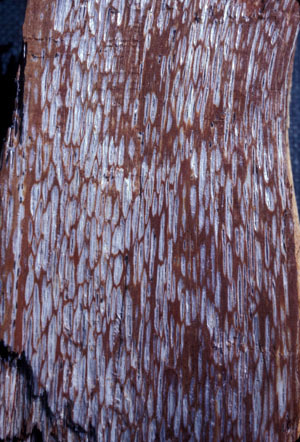 A cross section of wood from a white-pocket area of decayed wood showing delignified wood cells. These cells have no middle lamella (this is the area between cells that has high lignin concentration). Only the cellulose-rich secondary walls remains after advanced decay. Brown-rot fungi depolymerase cellulose rapidly during incipient stages of wood colonization. 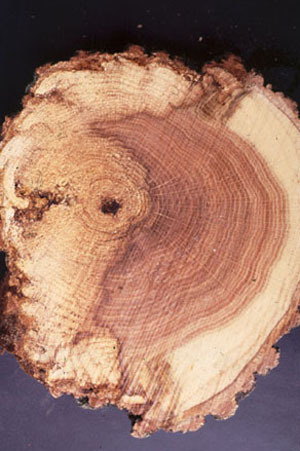 Considerable losses in wood strength occur very early in the decay process, often before decay characteristics are visually evident. Cell wall carbohydrates are degraded extensively during decay leaving a modified, lignin-rich substrate . The residual wood is brown and often cracks into cubical pieces when dry. 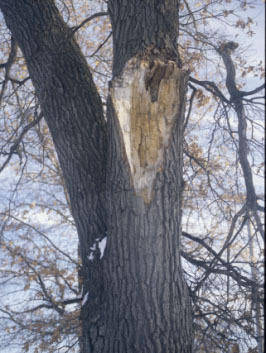 Brown-rot fungi commonly cause decay in living trees, downed timber and wood used in buildings. Since large losses of wood strength result from brown rot, living trees with this decay can be hazardous and wood in service may fail. Commonly, this type of decay has been referred to as dry rot. This term, apparently first used to describe any deterioration of dead wood or wood in service is misleading because moisture must be present for the decay to occur. An urban tree with brown rot. The large branch failed and broke off due to the presence of decay. Brown rot has little structural integrity and large losses of wood strength occurs early in the decay process. Urban trees with decay can be very hazardous. A closer view of brown- rooted wood is shown in this photo. In advanced stages of decay the wood cracks and checks into cubicle pieces. Little to no integrity remains in this decayed wood. 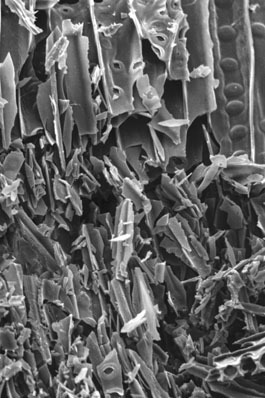 Scanning electron micrograph of brown-rotted wood. Only slight pressure causes the wood cell walls to crumble into minute fragments. Fungi that cause soft-rot are taxonomically classified in the subdivisions, Ascomycota and Deuteromycota. Soft rot was first characterized as a soft, decayed surface of wood in contact with excessive moisture. However, soft rots can occur in dry environments and may be macroscopically similar to brown rot. Two distinct types of soft rot are currently recognized. Type 1 is characterized by longitudinal cavities formed within the secondary wall of wood cells and Type 2 used to describe an erosion of the entire secondary wall. The middle lamella is not degraded (in contrast to cell wall erosion by white-rot fungi), but may be modified in advanced stages of decay. Large strength losses in wood can be associated with soft rot attack. 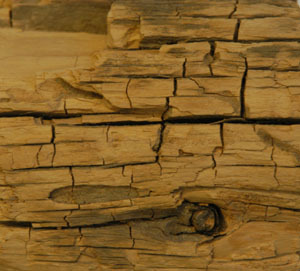 Cavities formed in the wood as well as extensive cellulose degradation can result in extremely poor strength characteristics when soft-rot wood is visually evident. As decay progresses, extensive carbohydrate loss occurs and lignin concentrations increase in the residual wood. Soft rot in wood often appears brown and can be confused with decay caused by brown rot fungi. Soft rot is different from other types of wood decay. Chains of cavities are produced inside the cell wall. 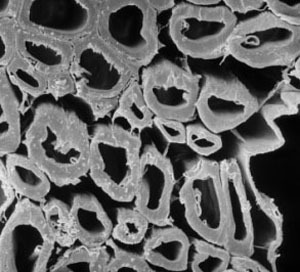 This micrograph taken of a section from soft-rotted wood and viewed with a light microscope shows cavities within the cell walls. Eriksson, K.-E. L., R. A. Blanchette and P. Ander. 1990. Microbial and enzymatic degradation of wood and wood componenets. Springer-Verlag. Berlin, New York. 407 pages. Blanchette, R. A. and A. R. Biggs. Defense mechanisms of woody plants against fungi. Springer-Verlag, Berlin, New York, 458 pages.